‘Ich erwarte auch von der deutschen Frau, daß sie sich in eiserner Disziplin vorbildlich in die große Kampfgemeinschaft einfügt’ (pp. 50f.). So declared Adolf Hitler in the Reichstag on 1 September 1939, the day on which German forces attacked Poland and thereby unleashed the Second World War. 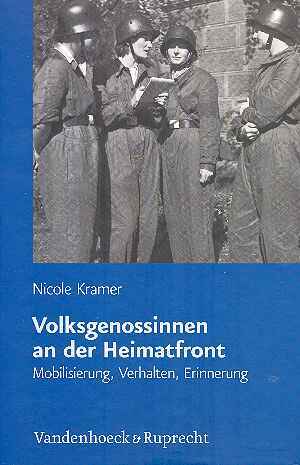 Nicole Kramer, in her new study, offers a fresh perspective on how German women were mobilised in support of Nazi militarist and expansionist goals. Her approach is twofold. Firstly, she emphasises the need to ‘historicise’ women’s role on the home front in order to separate it from myths surrounding the Trümmerfrauen and the personal battle for survival in the immediate post-war years. These myths, she argues, have more to do with the politics of the 1980s and 1990s than with the realities of life during and immediately after the Third Reich. Secondly, she sets out to integrate the history of Nazi organisational and welfare structures with the experience of the majority of German women who fell under the category ‘national comrades’ that is all those women who were not excluded from the Volksgemeinschaft on grounds of race, sexuality, political views or perceived ‘asociality’. In this way she hopes to overcome what she sees as the false dichotomy that often appears in previous works between a minority of Täterinnen who were actively involved in the Hitler regime and its genocidal mission in Europe, and the wider, supposedly private and inward-looking female civilian population (p. 340). The first chapter, on Nazi women’s organisations, is the most straightforward. Previous studies have pointed to the on-going problems that the Third Reich seemed to have in recruiting sufficient numbers of women into the wartime labour force, especially in comparison to Britain. Part of the problem, it has been claimed, was Hitler’s reluctance to introduce – and then to enforce – conscription of female workers. However, Kramer argues that if we shift our attention to the non-paid, honorary work which hundreds of thousands of women performed as members of the NSF (Nationalsozialistische Frauenschaft) or DFW (Deutsches Frauenwerk) or, on a larger scale still, as volunteer recruits into air-raid protection or evacuation work, then the picture looks somewhat different. Indeed, the network of welfare services created or supported by the NSF/DFW, sometimes in conjunction with other agencies, reached into the smallest communities and became a vital tool for maintaining morale during the war. The same organisations also acted as an intermediary between the regime and the people, monitoring and controlling discontent, especially in the wake of the Allied bombing campaign, and helping to identify and isolate individuals perceived to be potential trouble-makers or a threat to the Volksgemeinschaft. Overall, Kramer argues that Nazi Germany was in fact more successful than its western European enemies in mobilising women for voluntary war work (p. 80). When it comes to looking at the home front more broadly, and particularly at women who were recipients rather than providers of wartime social aid, the sources are admittedly scarcer. Oral interviews conducted by members of the United States Strategic Bombing Survey (USSBS) in thirty-four German cities between May and July 1945, and private mail seized by the US army, suggest that Nazi welfare efforts provoked ‘gratitude’ and ‘disappointment’ in equal measure but also hint at the important ‘stabilising function’ of NSF/DFW work (pp. 346ff.). Even women who were not, or were no longer, Nazi supporters could find positive things to say in 1945 about wartime social relief and evacuation programmes, reinforcing the USSBS’s conclusions that bombing did not sap civilian morale to the extent that they had hoped for (pp. 284, 312, 317). However, Kramer rejects Götz Aly’s view that the Third Reich was a Gefälligkeitsdiktatur, a regime which conveniently shielded the German people from the hardships of war by plundering and redistributing the wealth and property of non-Germans. Instead, she sees Nazi welfare policies in terms of their disciplinary role. The beneficiaries were expected to behave as good folk comrades, and could have access to support withdrawn if they did not (p. 348). Moreover, by distributing or accepting certain types of material aid – such as furniture and other items confiscated from deported Jewish families and handed over to bombed-out German families – Volksgenossinnen were drawn into the policies of the Nazi racial state. Guilt about this involvement in the persecution of the Jews, and fear of Allied retribution, may in turn have reinforced the widespread sentiment after July 1944 that even if the war was now clearly lost, the German nation still had a stake in the survival of the regime, as no other future was imaginable beyond dire punishment. Admittedly, this was a view that largely disappeared in May-July 1945, except among hard-line former members of the NSF/DFW (p. 101). After July 1944, when even the nominally independent (and largely female) Reichsluftschutzbund (RLB) was brought under the direct control of the party (p. 110) only one institution managed to preserve some of its autonomy vis à vis the regime, the church. Yet here too Kramer suggests some revisions to the conventional historical picture. Certainly, the church lacked the material wealth and organisational strength of the party. Yet it was still an important actor on the home front, offering spiritual comfort to the isolated and bereaved, mediating in disputes between evacuees and local communities, maintaining contacts with families and creating new social bonds to replace those broken by wartime dislocation. Furthermore, while Kramer recognises that both party and church suffered from dwindling numbers of female volunteers in the final phase of the war, this did not necessarily mean that they were thrown into increasing conflict with one another, or that individuals in need were forced to rely solely on private and family networks to survive. Rather, the realities of a collapsing home front and impending defeat actually increased the pressure on church and party, including its volunteer women activists, to work together to maintain a ‘kämpfende Volksgemeinschaft’ to the last (pp. 350f.). Overall Kramer successfully demonstrates that German Volksgenossinnen did not just passively tolerate the war; rather, they actively sought to shape their own role within it. The voluntary, ‘self-help’ nature of their participation in turn distinguished them from those millions of men and women who were murdered, deported or enslaved by the Third Reich on grounds of their race. However, the book also leaves some questions unanswered. One point that is raised, but not sufficiently engaged with, is that the ‘Partizipationshunger’ and ‘Einsatzbereitschaft’ of women were at their strongest when it came to supporting men at the front, for instance by knitting clothing for the troops, or visiting wounded servicemen in hospitals (pp. 74, 87f., 91). This suggests an important dimension to women’s (and men’s) experience of the war which still remains underexplored in the literature, namely the trend towards a ‘militarisierte[...] Kameradschaft der Geschlechter’ , based on shared goals and expectations, rather than on separate, male- and female-specific visions of the future. What this ‘comradeship between the sexes’ meant for contemporary understandings of gender and gender relations, and for related notions like individualism and collective struggle, hardness and tenderness, and – last but not least – self-help, empowerment and survival, is a subject worthy of further investigation. Götz Aly, Hitlers Volksstaat. Raub, Rassenkrieg und nationaler Sozialismus, Frankfurt am Main 2005. Sybille Steinbacher, ‘Differenz der Geschlechter? Chancen und Schranken für die “Volksgenossinnen”’, in Frank Bajohr and Michael Wildt (eds.). Volksgemeinschaft: Neue Forschungen zur Gesellschaft des Nationalsozialismus, Frankfurt am Main 2009, pp. 94-104 (here p. 100). Matthew Stibbe: Rezension zu: Kramer, Nicole: Volksgenossinnen an der Heimatfront. Mobilisierung, Verhalten, Erinnerung. Göttingen 2011 , in: H-Soz-Kult, 03.02.2012, <www.hsozkult.de/publicationreview/id/rezbuecher-17547>.